Today I'm going to show you step-by-step how to finally clean your green swimming pool (FAST). In fact: the strategies in this post have kept my own pool free of green water for a LONG time. And today I'm going to show you the exact steps YOU can take to clean your green pool (and keep it that way for good). Why is your pool green? 1. Does it need to be drained? In most cases, a pool will become green because of an overgrowth of algae, but the causes for this overgrowth can vary. Improper PH balance. A pH level that's too low can erode pool materials and cause eye irritation, but too high and it will not kill bacteria or algae and can also cause skin irritation. A PH level that is out of balance in either direction can lead to issues with water discoloration (read: How to balance pool water). Clogged filter. If your filter isn’t working (check out the best pool filters), you’re obviously going to have trouble keeping it clean. Not only will algae continue to grow, but you could also be breeding bacteria and debris that will discolor the water. Change in weather. Algae thrives in warm, humid environments, so if you’ve recently experienced a change in your weather, you’ll need to be extra diligent about cleaning the pool. Hopefully now you’ve pinned down the culprit of the discolored pool, so let’s get down to business! It may seem like the end of the world (or at least the summer) when your pool turns into a slimy green mess, but rest-assured, pool owners, I’ve got you covered. If you follow these six simple steps to cleaning your green pool fast, I’ll have you back on your floatie in clean water in no time. If your pool is dark green, bordering on a blackish color, it may be more effective to drain the pool completely and acid wash the surface. If not, you will need to make your own decision about whether to drain the water or continue to try chemical treatments. You'll first want to test your pool's pH to get a good idea of how much it needs to be lowered. There are lots of testing kits for water chemistry available (check out the best pool test kits) that range in cost from under $5 to well over $50, but a good kit like this one from AquaChek (click here to check the price on Amazon) will serve your purposes just fine. Since your pool is green, we already know the chlorine level is probably way too low, so you can skip testing that if you’d like. The main thing you will be testing is the PH level. A healthy PH level for a pool is right around 7.5, but for this project, we want it even lower—below 7.2. This will keep the water from becoming even more cloudy in the following steps. Once you know what the PH level is, you can use a sodium bisulfate product to reduce it. Simply follow the manufacturer’s instructions for adding the product to your pool and test it again in a few hours. How much you add will depend on how acidic your pool is. It’s always recommended to use about ¾ as much as it calls for to begin with so you don’t overdo it. Now it's time to shock your pool with granular chlorine (calcium hypochlorite)! 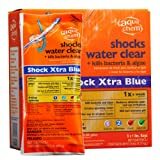 Shocking your pool is a method of adding a super shock liquid chlorine like Aqua Chem (click here to check the price on Amazon) to the water to instantly kill off most of the bacteria and algae. Most pool shock products give great instructions on how much to use for various situations, but Pool Spa News states that scientifically, to de-structure the DNA of algae, you need to chlorinate the water to 30 ppm (or 30 parts per million). Use your testing kit to reach the right balance. Next, you’ll need to pump the water and filter it to regain balance. How you do this will depend on the type of filter you have. If you have a DE or a sand filter, you’ll want to backwash the filter (aka clean your filter) before you do anything else in order to remove dirt and sediment. Turn on the pump. The water should flow out backwash pipe or hose. Adding a flocculent helps the debris clump together so that it can easily be vacuumed from the bottom of the pool, leaving you with crystal clear water. You’ve probably eliminated most of the algae in your pool by now and you may even feel that another step is just not necessary, but taking this one extra step could possibly keep you from having to repeat this entire process again in another week. The thing is that algae grows very quickly and can take over your pool from just a few tiny spores. Killing it will drop it to the bottom of the pool floor. A good algaecide like this one from Kem-Tek (click here to check the price on Amazon) can kill off those remaining microscopic spores, and continued treatment can prevent it from returning. The easiest way to clean your pool is to maintain it well enough that algae and debris don’t get out of hand. Check filters and pumps frequently. Algae thrives in stagnant water, so ensure that your filter and pump system is cleared of debris and working properly to keep the water moving and organisms skimmed off. Brush and vacuum weekly. Scrub the surface and vacuum the bottom of the pool weekly to keep any dead algae or bacteria from growing. Maintain a healthy PH level. It's recommended to test your pool’s PH levels 2-3 times a week along with your liquid chlorine (source). The recommended level to maintain is between 7.4 and 7.6. This level should stave off any algae spores before they have time to bloom. Use a pool cover. Keeping out debris and other organisms that might blow in will help keep the yuck to a minimum. It will also keep the sun from supercharging any algae spores that are already lingering. “An ounce of prevention is worth a pound of cure,” so they say, and that couldn’t be truer than it is with swimming pool maintenance. A little extra TLC on your pool every week will keep you from having to muck out a dirty green mess once a month. Now, go grab your suit and dive in!